Collaborative sensemaking occurs when a group of people with diverse backgrounds engage in the process of making sense of information rich, complex and dynamic situations. Our understanding of collaborative sensemaking and critical functionalities to support such sensemaking is limited. In this paper, based on review of relevant literature, we outline a set of broad requirements critical for supporting collaborative sensemaking. 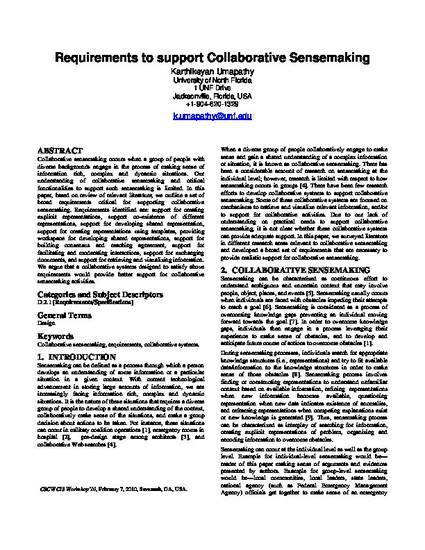 Requirements identified are: support for creating explicit representations, support co-existence of different representations, support for developing shared representation, support for creating representations using templates, providing workspace for developing shared representations, support for building consensus and reaching agreement, support for facilitating and moderating interactions, support for exchanging documents, and support for retrieving and visualizing information. We argue that a collaborative systems designed to satisfy above requirements would provide better support for collaborative sensemaking activities.